A Partial Synopsis from Book Depository: Every woman deserves a shed of her own, somewhere to retreat to for some quiet time, to create or grow, to write or paint, or just to contemplate the view. 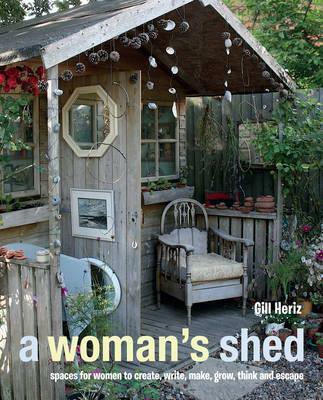 Gill Heriz has interviewed over 80 different women, and Nicolette Hallett has photographed their sheds inside and out, to collect together this unique insight into why women have sheds, and what they do in them. My Thoughts: This book caught my eye on a gloomy day after surgery. (Have I mentioned lately how much I love my public library?) The photography really makes the book come alive. I loved seeing each shed, whatever its intended purpose and was especially curious about lighting and storage. My indoor creative spaces are my greenhouse and my craft room. I definitely have some new ideas on arranging and organizing my space. This little gem of a book certainly brightened my gloomy day! I must admit I would like a working shed, mine is just filled with other peoples stuff. Yes, absolutely! I'd love my own she-shed where I can be creative and have some alone time!! My indoor space is my woman cave or what hubby calls my dish room. I store every decor item not being used at the moment and I have been pondering on really clearing it out and turning it into a dreamy space to sit and relax and look at all the knick knacks not being used. But a she shed would definitely be perfect spot away from the house! Thanks for joining the DI & DI Link party. We have just redone the outside of our shed. I am now contemplating the inside and I think I need to check out your book! As for reading, I have a stack of books that I bought at a Local Authors book signing where 20+ local authors were showing their books. I've got a lot of reading to do. I think a she shed is a great idea. Especially for Moms. This book looks like a great way to relax, flip pages and daydream. Love this idea! And I have a building I could use. Thanks for the inspiration! I so want a shed! I could get so much done (reading, crocheting....). Must get this book! I would love, love, love a shed or cottage or tiny house in my back yard. Just my own private space to have and do anything I want. Yes, yes, yes!